Trailer: Explore Subterranean Terrors in Bene.. Exclusive Poster Debut for the IFC Release Be..
What Lurks Beneath in This New Photo Gallery? 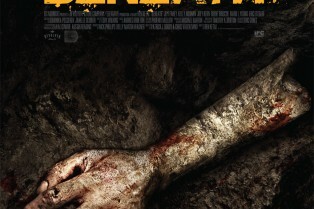 Witching & Bitching, Beneath Get Release..
One of the many films making their premiere at Screamfest in Los Angeles is Beneath from director Ben Ketai and Revolver Pictures. A teaser trailer has hit the web and you can watch it in HD after the jump. Beneath concerns a young attorney and a group of miners who are trapped underground after a disastrous collapse and begin a descent into madness. Brent Briscoe, Rene Rivera, Mark L. Young, Kurt Caseres, Erik Etebari, David Shackelford, Ashway Lawver and Jason Masek round out the cast.